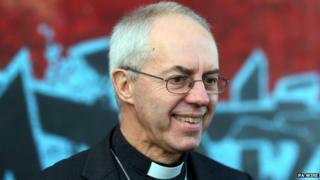 Image caption Justin Welby said immigration must be managed "carefully but also generously and hospitably"
The UK should not view immigration as a "deep menace", the Archbishop of Canterbury has warned. Part of the country's "strength and brilliance" lay in its long tradition of welcoming foreigners, the Most Reverend Justin Welby said. But the process of immigration must be managed "prudently" to avoid "over-burdening our communities", he added. He also said clergy had noticed a rise in "minor-racist, anti-foreigner, anti-Semitic, anti-Islamic" sentiment. Criticising the language often used when debating the issue, Dr Welby said people had to be "realistic" about the pressures of immigration. But the heart of Christian belief was that "all human beings are of absolute equal and infinite value", he added. Asked at a press lunch in Westminster about the public disclosure of cases of child abuse perpetrated by members of the 9,000-strong Anglican clergy, the archbishop said "there's more that's not been revealed" and "a very significant legacy of unacknowledged cases". He told of how he "broke down completely" when hearing personal testimony from survivors of Church abuse. Describing child abuse as a "betrayal", he said the Church was supposed to "hold itself to a far, far, far higher standard" than other institutions but had "failed terribly". He added: "It is beyond description terrible. When you abuse a child or a vulnerable adult, you mark them for the rest of their lives." Now, he said, the Church was taking the issue "as seriously as we can". "Survivors come first, not our own interests," he insisted. Dr Welby also said the Church was undertaking a diocese-by-diocese audit of all personnel files kept since the 1950s. The audit will be reviewed by an external body. He claimed greater training was now being given to clergy, and said bishops met regularly with survivors of child abuse. He suggested there were plans under review to reconsider the confidentiality of the confessional, a "radical move" that "challenges 1,800 years of Church traditions".